The Rapid Afghan is an indica dominant autoflowering variety which mostly carries genetics from the Afghan family. 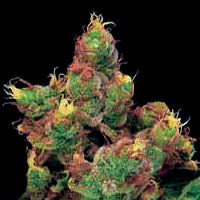 A small amount of sativa influence can be traced due to the addition of Skunk to the mix. Thanks to the Skunk it has become possible to get this variety stable and reliable. The Rapid Afghan can get rather large, especially for an autoflowering cannabis variety. Although the Rapid Afghan won't get higher than 90 cm inside, the Rapid Afghan can reach a height of over one meter with very strong lateral branches outside. The Afghan is renowned for its large harvest and this characteristic has been passed on to the Rapid Afghan. The buds are therefore large, compact and entirely covered by glistening trichomes. The Rapid Afghan will guarantee you a very large harvest. The taste and scent of the Rapid Afghan is reminiscent of the great Afghan of times gone by. Robust, spicy and herbal; simply a variety with spirit. 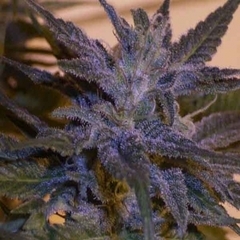 The effect of the Rapid Afghan is relaxed and dreamy combined with a typical indica body buzz. Give the buds enough time to dry and let the Rapid Afghan take you back to times long past. Rapid Afghan is 100% autoflowering and will complete her life cycle in 65 - 70 days. From seed to harvest!